There is no day that I would not carry my little pale pink makeup bag with me. I got it from Primark for £4 if I remember well and I love it. It has two compartments and it also has the letter “L” on the front and also on the zip. It is a cute, inexpensive makeup bag that I adore! 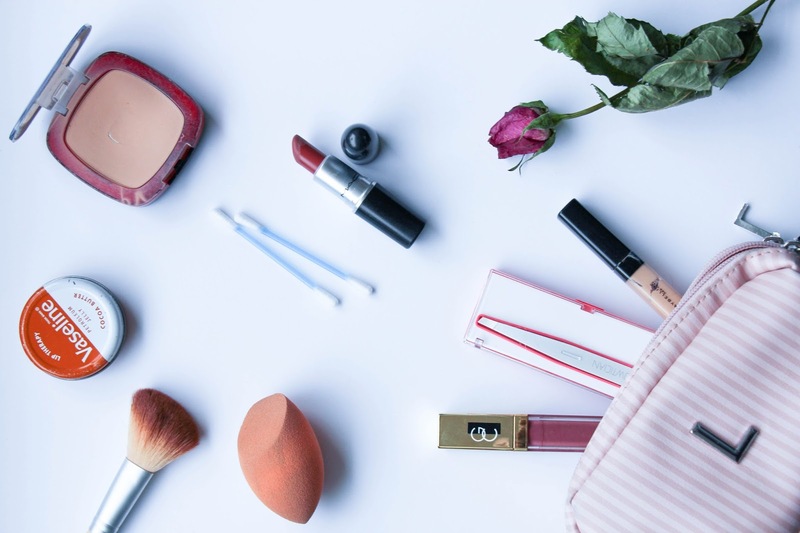 I take it everywhere with me (as long as it fits on my handbag) and there I have all my daily makeup essentials that can save a bad makeup day in any time! Lipstick of the Day | This is an item that changes quite often but I always carry a lipstick with me. On a daily basis I normally wear MAC Lipstick in Whirl and on top the Gerard Cosmetics Lipgloss in Plum Crazy, a perfect combo! Concealer | I always tend to have concealer with me just in case I need to touch up my foundation. Sometimes it can fade in some areas of my face and it is always nice to have some concealer to correct those areas. Currently, my go-to concealer is Fit Me by Maybelline in the shade 10. My (very) dirty Beauty Blender | I am sorry, I should have washed it prior to taking this photo but… oh well, this is my reality! My Real Techniques Miracle Complexion Sponge is always by my side and it will save me when my foundation is sinking in my fine lines haha Also, you need it to apply your concealer, correct? Cotton Buds | I always need some cotton buds when applying my makeup or afterwards. You know when you get that annoying bit of mascara transferred to your eyelid? So this is where the cotton bud comes handy. It will remove the mascara from that spot without ruining your makeup. I always have some with me! Sometimes you can find them in the pockets of my jeans or jackets. Seriously! Powder + Brush | Having a combination skin, my “T” zone can get a bit oily and shiny – specially my chin – and my foundation tends to fade in those areas. To prevent that, I pad the area with a tissue to remove the excess oil, dab slightly with the beauty blender and then put some powder to make it last a bit more. I don’t really know if this is something you should do but it works for me and my foundation looks good all day! I am currently using the L’oreal Infallible 24h Matte Powder in 160 Sand Beige. Love this powder and it also has a mirror so, it is perfect! Tweezers | You never know when you will need a good pair of tweezers correct? I have mine with me almost all the time. In reality, I have them in my makeup bag if I am wearing false lashes, along with some eyelash adhesive. I once was the one that her eyelash fell off and I had no way of putting it back! So I ended up no false lashes and rubbish eye makeup. That is not going to happen again and so I always have tweezers with me (and eyelash adhesive too)! The tweezers I have are the Browtician Crystal Rouge Tweezers that I got from Superdrug. Lip Balm/Vaseline | With this cold weather I always have chapped lips and I hate it! So, the solution for it is to carry a lip balm or my so trusted Vaseline with me everywhere. Vaseline Lip Therapy in Cocoa Butter is my favourite! Apart from all of this, I always throw in my bag some tissues to and a hand cream! Two items that always come handy. What do you have in your make up bag that you cannot live without?